Meadowhall shopping centre is to get an investment of £50m during the 25th anniversary year of its opening. 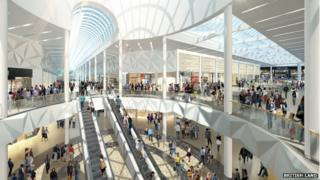 British Land, the site's owners, said the refurbishment of the centre near Sheffield, South Yorkshire, would start later in the year and finish by 2017. The work will mainly be done out of hours, to allow shops to remain open. Meadowhall is the UK's fourth-largest shopping centre and contains 310 shops, 50 restaurants and cafes and a multi-screen cinema. It was opened in 1990 on the site of a former steelworks and attracts more than 25 million shoppers a year, according to British Land. The work will enable some retailers to install double-height shop fronts. New lighting is also to be installed, along with new wood and metal finishes in the centre, the owners said. Video Shopping malls: saviour or curse?